Many people find the outdoors to be such an uncomfortable place to be. Usually, these individuals love to stay in their homes, where they can stay warm and dry at all times. The outdoors simply cannot give them the same promise, because it can be a very unpredictable place and setting. However, the outdoors can also be exciting and beautiful. It can provide you the most breath-taking views you will ever experience in your life. This is why you mustn’t avoid it. You must embrace the outdoor life from time to time. All you got to do is to settle in and prepare for scenarios you might encounter, including cooking outdoors. Most of the time, outdoor cooking literally means you have to be an expert in outdoor DIY projects. This is because there are some things you need to do to successfully accomplish this task. There are many things you can cook using this method; meals such as hotdogs, fish, ham, cubed steak, stew meat, turkey, chicken, pork, and even hamburgers. You just have to be creative enough. In foil cooking, you must first find a heavy duty aluminium foil large enough to cover your food choice. After you secure your food by sealing the foil tight around it, place it on a bed of hot coals. Then, keep rotating the whole package over and over until all sides of your food has been thoroughly cooked. 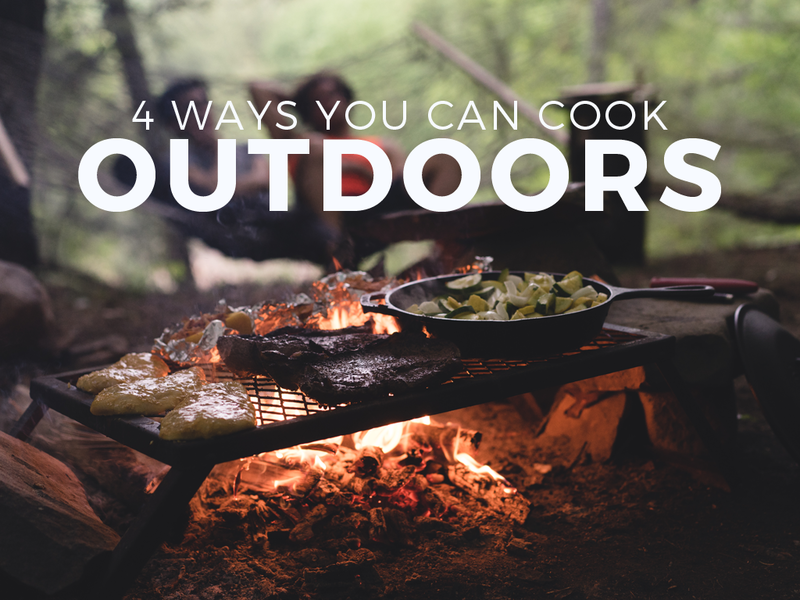 Tin can cooking is really a simple way of outdoor cooking—it certainly is one of the simplest outdoor cooking methods on this list. What you need to do is to first get a large tin can that is big enough to contain and cook your meals. Next is to layer your meal on top of each other. Here’s a tip: place the meat on the bottom, vegetables on top of the meat, and the seasonings on top of the vegetables. Then, get a foil to cover the entire tin can (be sure to use a heavy duty one). Finally, place the can on a bonfire and wait for it to be cooked entirely. Ash cooking is another outdoor cooking method that uses coals as the source of heat; so be sure to stock up on them to be fully prepared to do this. This method is great for cooking fish. All you have to do is to place your chosen fish dish inside (edible) leaves. Then, secure the leaves around the fish by using its stems as strings to lock the fish inside. Place the whole package on top of the hot coals and wait approximately 15 minutes before removing the fish from the coals. Sometimes, it is very hard to tell whether the leaves of a plant are safe to cover your chosen meal. You would not want to end up being poisoned because of these leaves. This is why if you aren’t sure about the leaves around you, you can use a broiling rack instead. Now, for this outdoor cooking method, you would have to create a device similar to a tennis racket using the branches you can see around you. Once you have done this, this device will serve as a rack for your food. Place it over a bonfire, wait for you food to be cooked, and Voila! You get to have some smoked and tender fish for you to eat. The outdoors can feel intimidating at times. But, surely, there is nothing for you to fear as long as you are prepared and you know what to do. Remember, information is power for most things in life!